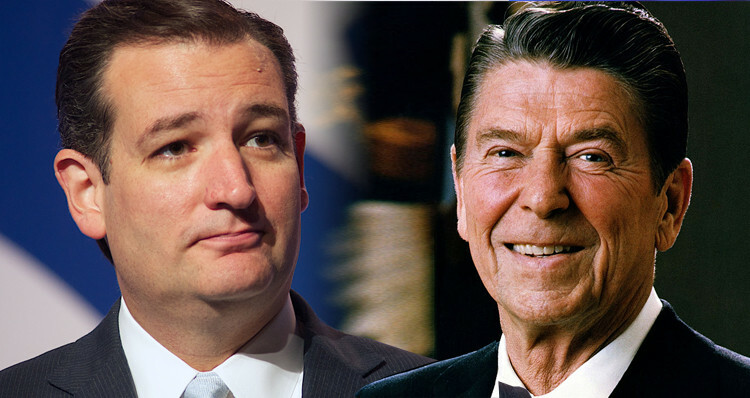 Ted Cruz – You Do Realize Ronald Reagan Would Have Despised You, Right? But here’s the problem. If one actually takes the time to look at Reagan’s record, you oppose his viewpoint on nearly every single issue – at least the big ones. In all fairness, were Ronald Reagan around today – he would despise you, or at least despise your politics. So if you are going to continue calling Reagan your hero, you are going to have to make a lot of changes – and I mean FAST. To make it easy for you, I have broken Reagan’s record down into 5 main areas so you can immediately begin your 180 degree turnabout to get your own beliefs and practices back in order. And we cannot forget that when he was governor of California, Reagan signed into law the largest tax increase in the history of any state up until that point, in an effort to balance the budget. Once president, Reagan raised taxes seven out of eight of his years in office — including four times in just two years for a total of 12 times as president. And one cannot forget that all but two of the budgets he submitted to Congress proposed more spending than Congress sent back to him to sign. Moreover, Reagan also backed a $3.3 billion gasoline tax, and he bailed out the Social Security program to the tune of $165 billion. Additionally, Reagan and Barack Obama agree, nearly word-for-word, on taxing the rich and closing tax loopholes. President Reagan made the remarks below in a June 6, 1985 speech at Atlanta’s Northside High School, while campaigning for a broad tax-reform proposal that ended up passing in 1986. Reagan ended up raising the debt ceiling 18 times during his presidency. Who can forget that Reagan granted amnesty to aliens as president, giving citizenship to over three million illegals living in the USA with the stroke of a pen, a position antithetical to current GOP ideology. “Ronald Reagan signed a sweeping immigration reform bill into law. It was sold as a crackdown: There would be tighter security at the Mexican border, and employers would face strict penalties for hiring undocumented workers. But the bill also made any immigrant who’d entered the country before 1982 eligible for amnesty — a word not usually associated with the father of modern conservatism. In his farewell address as president, Reagan envisioned America as a city on a hill: “And if there had to be city walls,” he said. “The walls had doors and the doors were open to anyone with the will and the heart to get here.” Strong words from the idol of those who now want to build even taller, electrified walls. BONUS: Here are a few other areas that will require adjustment, such as EQUAL RIGHTS for the LGBT COMMUNITY. You will have to become PRO-CHOICE, support EXPANSION OF GOVERNMENT, and OF COURSE — you are going to have to START SUPPORTING OBAMACARE. As the hero of a party that has worked tirelessly to destroy the civil rights of homosexuals, Reagan was a maverick in his strident opposition to the Briggs Initiative in California, which would’ve banned gays and lesbians from teaching in the public schools, and his opposition helped defeat the measure. Reagan did little to tighten restrictions against abortion as president and actually passed the most liberal pro-choice legislation up until that time as governor of California, the Therapeutic Abortion Act, signed by Reagan on June 14, 1967. He grew the size of the federal government tremendously, adding 60,000 new government jobs (versus, for instance, Bill Clinton, who shrank government payrolls by 373,000). As governor of California, Reagan supported and ultimately expanded Medi-Cal, which is the nation’s largest Medicaid program. Both as governor and president, he was one of the most proactive presidents in restricting smog emissions and protecting wilderness. Nobody knows what Reagan, who died in 2004, would make of the current fight over the debt limit. But 100 years after Reagan’s birth, it’s clear that the Tea Party Republicans have little regard for the policies of the president they claim to venerate. Tea Party Republicans call a vote to raise the debt ceiling a threat to their very existence; Reagan presided over 18 increases in the debt ceiling during his presidency. [W]ould have made Reagan’s entire agenda impossible, including the military buildup that conservatives credit with winning the Cold War. I continue to find this fascinating because of the striking disconnect between Republicans’ principles and their understanding of history. On the one hand, Republicans have a religious-like reverence for “Ronaldus Magnus”; on the other, they have no use for his approach to governance. It’s comparable to evangelical Christians holding out Jesus as their model for salvation and perfection, only to ignore Jesus’ commitment to protecting the poor and less fortunate. I agree, but shouldn’t that tell the political world something about the radicalism of today’s GOP? What should Republicans take away from the fact that, by 2011 standards, their party would dismiss their demigod as a tax-raising, amnesty-loving, pro-bailout, cut-and-run, big-government Democrat? 1. Bruce Bartlett (2003-10-29). “A Taxing Experience”. National Review.